Canada 150 (1867-2017): Strong. Proud. Free. In 2017, Canadians across the country will celebrate Canada’s 150th anniversary. The Government of Canada invites Canadians to learn more about the major events that have shaped their country’s history and express their pride in everything that Canada represents – a strong, proud and free nation. The Government’s profile on Twitter echoes the theme under the handle “Canada150th”, as does its Facebook profile, “Canada’s 150th Anniversary.” While the website does contain some references to “the milestones on the road to the 150th anniversary of Confederation,” most of the Government’s communications products emphasize 2017 as the sesquicentennial of Canada itself and not more accurately as the sesquicentennial of Confederation. In fact, “Canada,” as in the Canadian State, dates back to the Constitutional Act, 1791, when the Westminster Parliament first established the Crown colonies of Upper Canada (now Ontario) and Lower Canada (now Quebec) and their respective legislatures and executive governments. Through the Act of Union, 1841, the Westminster Parliament amalgamated the two Canadas into the United Province of Canada; finally, through the British North America Act, 1867, the Imperial Parliament re-organized three Crown colonies – the United Province of Canada, New Brunswick, and Nova Scotia – into a new federal Crown colony called the Dominion of Canada. Therefore “Canada’s” sesquicentennial occurred in 1941, and its bicentennial occurred in 1991. In 2017, the Government of Canada ought to commemorate the sesquicentennial of Confederation, but not of Canada itself. 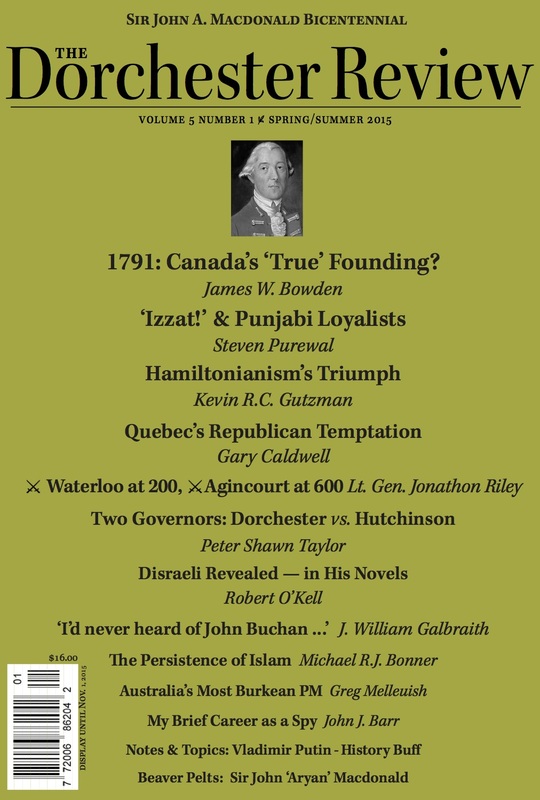 In 1791, the Imperial Parliament passed the Constitutional Act establishing Upper Canada and Lower Canada as Crown colonies operating under representative government, each having its own legislature and lieutenant governor. It is this polity, established by the Westminster Parliament through the Constitutional Act, 1791 that evolved, in a direct and unbroken line, into the modern Canadian state, a constitutional monarchy now under its own separate Crown of Canada. While the Maritime Crown colonies had achieved representative government and elections to their respective legislative assemblies earlier (Nova Scotia, 1758, Prince Edward Island, 1773 and New Brunswick, 1784), the system of representative government in the Canadas derives from an act of parliament rather than from executive instruments in the form of instructions to the Governors. Canadians, to the extent that they know of the Constitutional Act, 1791 regard it as a failure because its institutional framework did not provide for the self-government necessary to a mature and free society, and its inadequacy brought about the Rebellions of 1837 in both Lower Canada and Upper Canada. Nevertheless, it is this polity that the Westminster Parliament established through the Constitutional Act, 1791 that evolved, directly and unbroken, into the modern Canadian state, a constitutional monarchy now under its own separate Crown of Canada. In light of Lord Durham’s report on the Rebellions of 1837, including his controversial recommendation that the French-Canadians be assimilated into Anglo-Saxon culture through the political institutions, the Westminster Parliament re-organized Upper Canada and Lower Canada into one Crown colony, the United Province of Canada, through the Act of Union, 1840. Ironically, unifying the two Crown colonies produced the exact opposite effect: rather than forcing the French-Canadians in the former Lower Canada, or Canada East, to assimilate into English-speaking culture, the United Province of Canada necessitated a political culture of consociationalism and elite accommodation between equivalent English- and French-speaking political parties and even produced a dual or co-premiership, with one English-speaker and one French-speaker heading each Ministry. Furthermore, the British grant of Responsible Government in 1848 amounts to far more significant constitutional reform than the re-organization of the British North American Crown colonies a federal Crown colony upon Confederation in 1867, and the principles of Responsible Government in Canada have remained intact since. The Constitutional Act, 1791 marked the establishment of Representative Government in Canada, and, in accordance with Colonial Secretary Earl Grey’s letters and instructions, Lord Elgin implemented Responsible Government in the United Province of Canada after the general election of 1848 when he appointed Baldwin and Lafontaine, whose Ministry could command the confidence of the assembly. With respect to its institutional infrastructure, the Dominion of Canada is also the direct successor state to the United Province of Canada: the Parliament, Governor General, political executive, and civil service of the United Province of Canada became the Parliament, Governor General, political executive, and civil service of the Dominion of Canada on 1 July 1867. The legislature of the United Province of Canada voted in 1858 to establish Ottawa as its capital. On 1 July 1867, the parliament buildings in Ottawa that once housed the Legislative Assembly and Legislative Council of the United Province of Canada became the House of Commons and Senate of the Dominion of Canada. The Library of Parliament also transferred from the United Province of Canada to the Dominion of Canada, as did its chief librarian, Alpheus Todd. Viscount Monck became Governor General of British North America on 2 November 1861 and served in that role until the United Province of Canada became the Dominion of Canada; Queen Victoria issued him a new commission on 1 July 1867, and he served as the Governor General of Canada until 14 November 1868. Sir John A. Macdonald had served as Prime Minister of the United Province of Canada in three non-consecutive terms between 1856 and 1867. His last term began on 30 May 1864. Governor General Monck appointed Macdonald as the first Prime Minister of the Dominion of Canada on 1 July 1867; because the Queen’s business must go on, the first duty of the Governor is to ensure that there is a duly-constituted government in place. The first federal general election of the Dominion of Canada took place from August to September 1867, and Macdonald’s and Cartier’s Liberal-Conservatives won a parliamentary majority. With good reason, therefore, Alpheus Todd argues that Macdonald’s Ministry began not on 1 July 1867 but upon his previous appointment as Premier of the United Province of Canada on 30 May 1864. Upon the confederation of the British North American provinces in 1867, Sir John A. Macdonald was appointed Premier (his ministry having already been in existence in the Province of Canada for three years); and he continued as prime minister until November 5, 1873, when the Mackenzie administration was formed. […] In 1878 Sir John A. Macdonald returned to power, bringing with him most of his former colleagues, and remained in office until death removed him on June 6, 1891, having but one change of ministry in twenty-seven years. Finally, Confederation did not mark Canada’s emergence as a sovereign state. In 1867, the Dominion of Canada remained as much of a colony of the British Crown as had the United Province of Canada from which it inherited its legal and political infrastructure. Neither the United Province of Canada nor the Dominion of Canada had international legal personality and control over its defence and diplomacy. Not until the Statute of Westminster, 1931 and the emergence of the Crown of Canada as a separate legal person in the 1930s, particularly through the Royal Tour, Seals Act, and separate declaration of war in 1939, did Canada become truly sovereign and gain a distinct international legal personality. In short, Canadian history does not lend itself to the Romanticism of grand ruptures, bold declarations, or pitched battles against its mother country. And to the extent that it does, Canadian history turns on 1848 with the grand of Responsible Government – not upon Confederation in 1867. Canadian history is, in the main, political history, and this is why it has gained a popular reputation of being “boring.” There are no pitched battle cries that forged a nation out of turmoil of bloodshed; we lack the grandeur of French and American history precisely because Canada’s history does not flow from political Romanticism or a revolutionary ethos. And yet, sir, here we sit, patiently and temperately discussing how these great evils and hostilities may justly and amicably be swept away forever. We are endeavouring to adjust harmoniously greater difficulties than have plunged other countries into all the horrors of civil war. We are striving to do peacefully and satisfactorily what Holland and Belgium, after years of strife, were unable to accomplish. We are seeking by calm discussion to settle questions that Austria and Hungary, that Denmark and Germany, that Russia and Poland, could only crush by the iron heel or armed force. We are seeking to do without foreign intervention that which deluged in blood the sunny plains of Italy. We are striving to settle forever issues hardly less momentous that those that have rent the neighbouring republic and are now exposing it to all the horrors of civil war. The difference between celebrating the sesquicentennial of Confederation and celebrating the sesquicentennial of Canada itself might sound like a pedantic semantic debate, but it is in fact crucial and hinges upon an understanding of when Canadian history and the Canadian State began. “Canada at 150” implies that Canadian history begins in a French Revolution-style Year Zero of 1867 and that anything “BC” – before Canada – that antedates Confederation is “British” or “Imperial” and therefore ought to be filed under forgotten and treated as a shameful anachronism. Ironically, the Harper government has adopted the language of neo-nationalists who seek to relegate Canada’s British inheritance to a mere curiosity and historical vestige in an anti-monarchist teleology. Through the same rationale, Parliament in 1982 purged Dominion Day from Canadian history and sanitized it into the prosaic and tautological “Canada Day.” “Canada” existed before July 1, 1867 – but the Dominion of Canada did not. We ought to celebrate the Sesquicentennial of Confederation in George Brown’s terms in 2017, and we would do well not to conflate Confederation with Canada itself. And the Harper government in particular ought to know better, because it generally opposes the Liberal neo-nationalism of the 1960s. “Confederation at 150” would be a more accurate slogan because we are celebrating the sesquicentennial of Confederation, when the United Province of Canada became the Dominion of Canada and reorganized the existed Crown colonies into a federation, and not the sesquicentennial of “Canada” itself. Canada, Department of Canadian Heritage, “Canada 150.” http://canada150.gc.ca/eng/1342792785740/1342793251811 [accessed, 15 March 2015]. Canada, Department of Canadian Heritage, “Canada 150 – Road to 2017 – Milestones” http://canada150.gc.ca/eng/1359662086503/1359989806481 [accessed 15 March 2015]. United Kingdom, Foreign Office, “Draft of a Commission Appointing Viscount Monck the Governor-General of Canada,” 24 May 1867. Barbara Messamore, 1847-1878: Canada’s Governors General – Biography and Constitutional Evolution (Toronto: University of Toronto Press, 2006), 47. Janet Ajzenstat et al., editors, Canada’s Founding Debates (Toronto: University of Toronto Press, 1999), 14. I thank Nicholas A. MacDonald for having brought George Brown’s speech to my attention as well as for having shared his thoughts on the significance of Confederation. This entry was posted in Dorchester Review, History of British North America. Bookmark the permalink. The idea that James would write Liberal propaganda is one of the stupidest statements I have ever read and reflects a total lack of intelligence and ability to comprehend basic concepts. well dissolve me then because while interesting, your obvious use of this information to bash the present government is to me a disservice not only to Canada but to our history. Sadly I just let you waste 5 minutes of my time on Liberal propaganda!